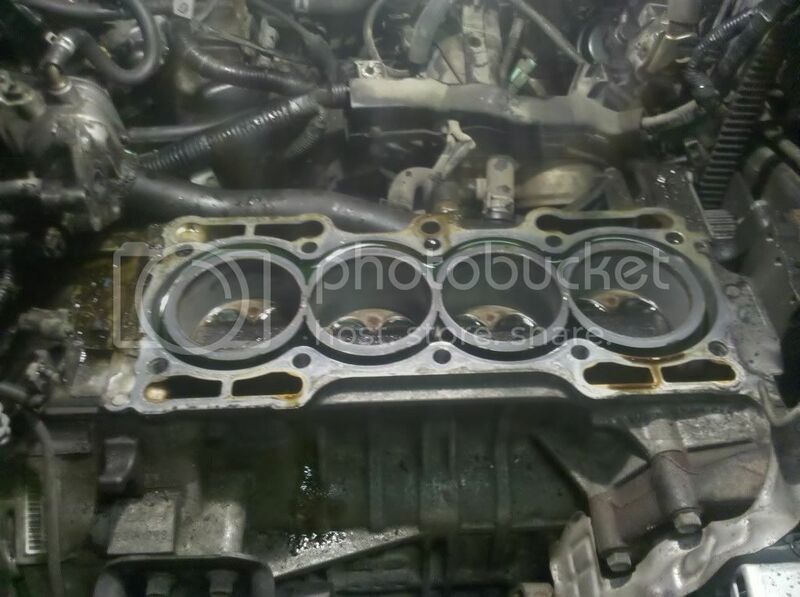 Okay so I have to rebuild my motor, my mechanic did a leak down test on my engine, and cylinder 1 leaks 25% 2 80% 3 90% and 4 95% so I am actually losing more air than im keeping lol, my mechanic said it was the piston rings so I am working on taking off my head, im pretty close and I wanted to get some opinions on MLS head gaskets an whether or not I should resurface my head and block, id rather not have to get my block resurfaced because i want to keep it in my lude and dont want to tow anywhere. So any opinions would be good, ill put up pics once i get the head off, hopefully today! Wow this is really long, ill save some of my other questions for later lol. BTW 98 SH 135k miles. thanks for the response, what rings and bearings would you recommend if the bearings need to be replaced? Sounds good, hopefully its not too pricey lol. I also have another question do you have to take off the side engine mount to take off the head or is that just to change your timing belt, and since I am going to be changing the timing belt also where exactly do you put the jack stand that you put down there after taking off the engine mount? some1 else asked this question. 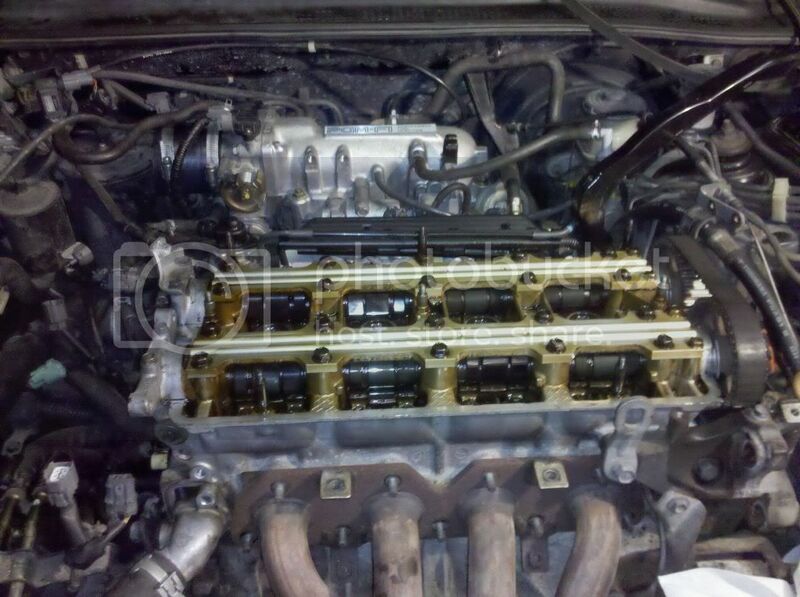 here is the link Easiest way to remove intake manifold? I got it lol, and now there is a new problem, I have the 98 Type SH and it looks like the oil pan is under part of the transmission anyone know how to get off the oil pan? and is it like this in the base also? yea i just copied whats n the manual cause im bored. 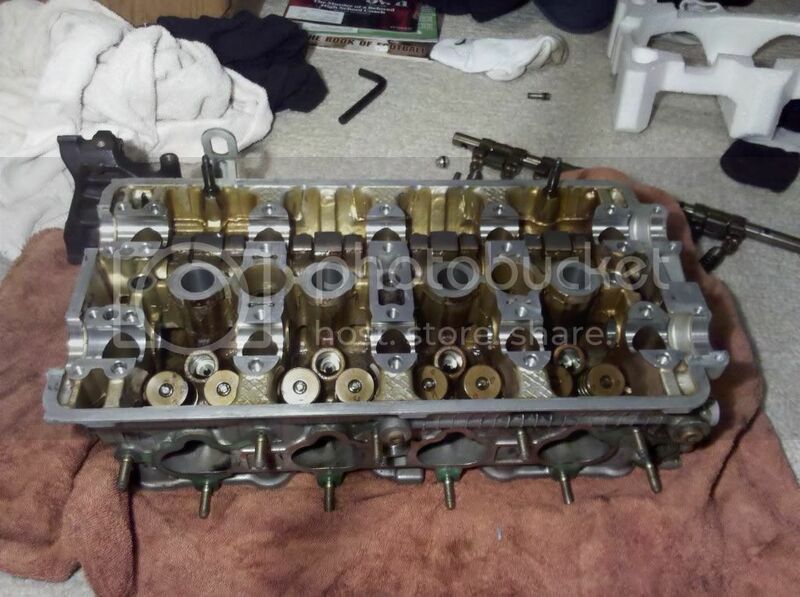 i want to know if anyone has used the skunk2 one piece forged valves (standard compression) with the skunk2 tuner series valve springs and not used the titanium retainers? Ok far as Honing the cylinders tha best bet is to take it to a machine shop. I heard Porsche uses similar cylinder walls and would be able to hone ur block. idk bout valves but might as well while ur at it get the titanium retainers...might be over kill but i would hate to half-a$$ it. Yeah ill see if I can borrow some money to get the titanium retainers, and I would rather not take the block out so I think im gonna end up honing my walls myself, and im in a small city in idaho it might be close to having a shop do it, im just gonna do a pretty light hone. Do not hone it yourself. Unless done in an automated honing machine, honing (by hand) takes experience and skill. And you don't just need to hone it, you need to hone it so the cylinder walls have the right RA and you need to put in the correct crosshatch so the new rings will seat properly. Just send it to a machine shop. EDIT: And, according to common sense and the latest AERA bulletin, you cannot hone FRM cylinders with regular honing stones and you cannot use honing oil. You must use silicon carbide honing "stones" with a silicon paste to hone it. There is also exact honing pressure and strokes/cycle specifications you must meet, as well as putting in a 60 degree crosshatch. Which you will not be able to do by hand, not without way more skill than you most likely have. Anyway, don't say I didn't warn you. Last edited by havikprelude; 01-28-2011 at 05:01 PM. Okay well I am taking out my block and having a machine shop hone it. And I have a couple questions. Couple questions, anyone know how to take out the valve seats out? And should you replace your master or slave cylinders if your replacing your clutch even if they are in working order before you replace your clutch, and what seals/o-rings you should replace when you are replacing your clutch. Yes u should replace master cylinder and slave if u doing clutch job. just saves u tha trouble mostly cause its not expensive and should be done by tha time u need to replace ur clutch. also if ur replacing ur clutch i highly recommend getting rid of the rubber damper for the hydraulic clutch line with a SS one. link -> Techna-Fit | Clutch Lines also it would be good to replace your rear main seal. Thank you, and I just bought the Exedy Stage 1 clutch and the Fidanza aluminum 8 pound Flywheel from gripforce clutches on ebay because I have only heard good things about them and it only cost me $415 :P they gave me a good deal! Thinking about getting the skunk2 high compression forged valves but want to do some more research before I decide about them, should be taking the block out on monday and getting it honed on wednesday or thursday, ordering all the parts i need by wednesday and having it all put back together sunday the 20th hopefully if everything goes to plan. Sweet nice set up i got the exedy stage 1 clutch also and hav only heard good things bout Fidanza flywheels. Sounds like ur working things out, looking foward to seeing this done. So am I! Here is my list of everything I have bought or am going to buy, someone tell me if I am forgetting anything please. 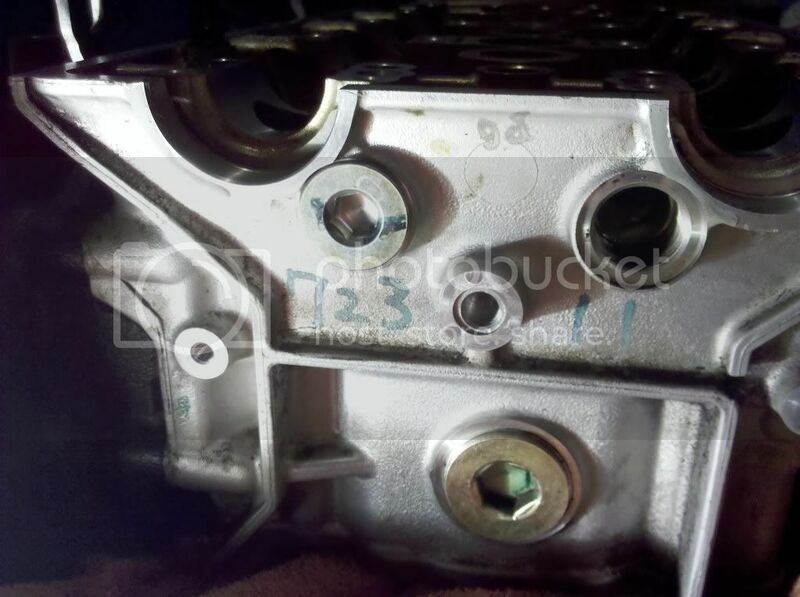 oil pan gasket - $7? head & block resurfacing - $100? Update, I want to pull the motor this weekend. I have ran into a lot of problems lately, mainly trying to get my axle nuts off. Now I am having trouble getting off the ball joints, I think I am going to need a bigger hammer because I am hammering the crap out of them and nothing is really happening. I have almost all the parts I need, I just need to get that motor out of there! My valves and titanium retainers just came today I got the high compression valves and I weighed them and my stock valves and the high compression valves are 1 3/4 ounces and the stock valves are 1 7/8 ounces. So I am definitely not concerned with the weight of the high compression valves as a problem and I am excited to see how they work out. I also weighed the stock retainers and the titanium retainers just for fun. Stock ones were 1/2 an ounce and titanium ones are 1/4 an ounce. I keep getting excited because of all the new parts but I am not making much progress in getting that motor out of my car.